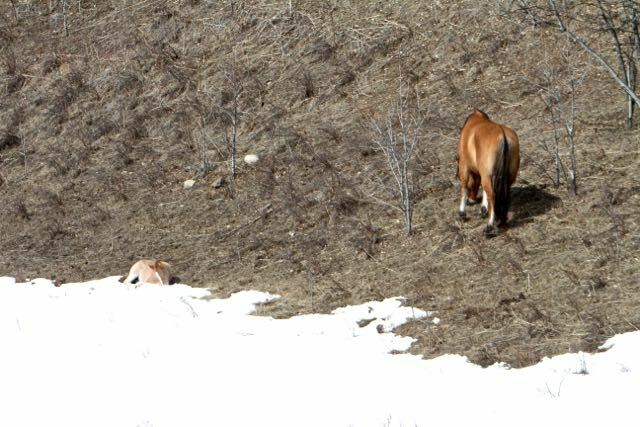 After a seemingly endless winter, spring finally came and with the warmth of the sun so did the grasses that our wild horses so desperately needed. The hillsides and meadows are now green with plants of all varieties. 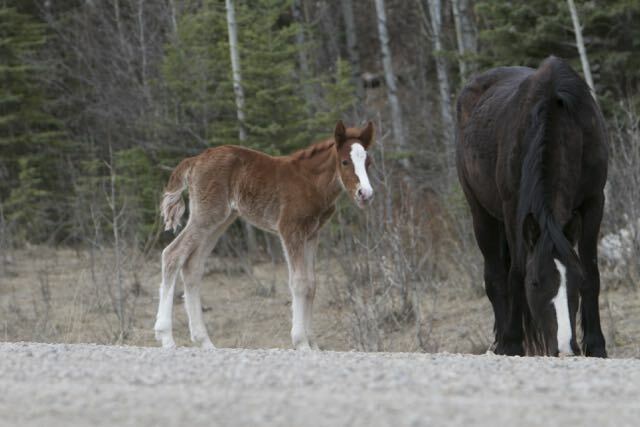 Throughout May and now into June the wild horse mares that were bred are giving birth to the next generation. Although they are still thin, they can forage easily now and produce bountiful milk for their beautiful wonders. 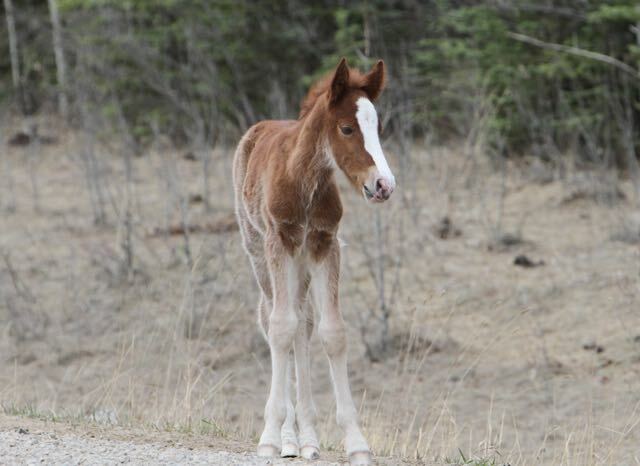 At this time of year, WHOAS volunteers are out in the field documenting the number of foals in our research area. 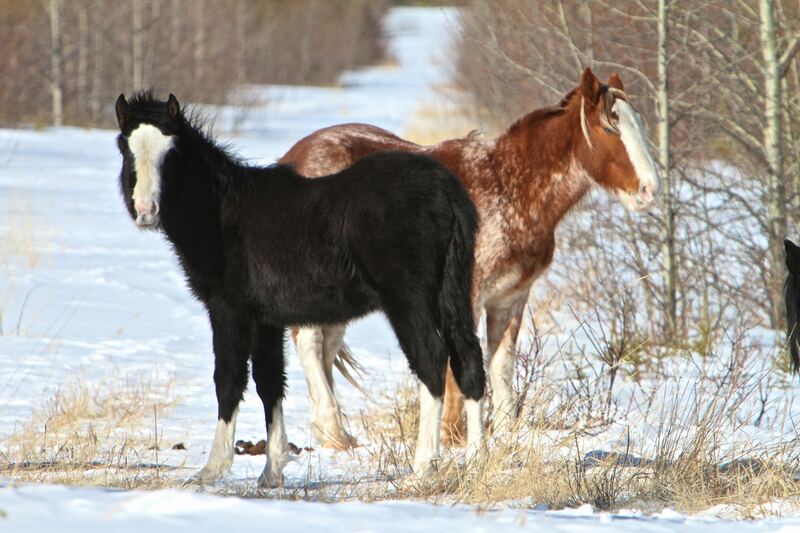 This information is being gathered to assist in our yearly report to the AEP on the wild horses. We had noticed throughout the long winter months that a number of the larger herds split up. This was to enable the horses to find enough feed to survive. 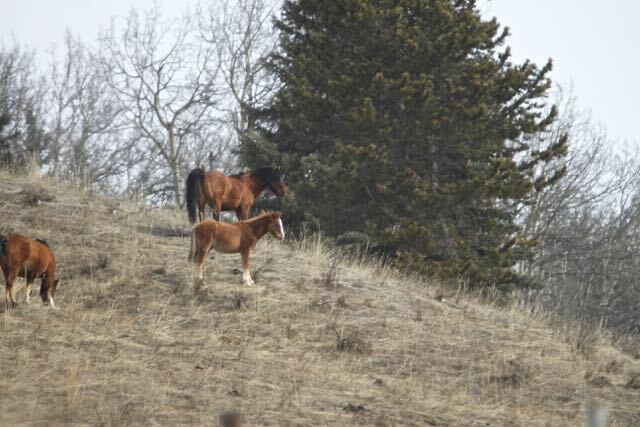 Now going into spring and the foaling season we are finding several small herds where it is just one stallion, a mare and her baby. This is just nature assuring their survival. As we are out in the field doing our observations throughout the week, we have been entertained by the antics of several of the young bachelor bands we have come across. Always on the move, they constantly test and pester each other. Here another pair are engaged in a wrestling match. These are so fun to watch as little harm comes to either, just a few scratches and bite marks. The other evening as we travelled about we were entertained by a couple of groups of wildies including these two youngsters. 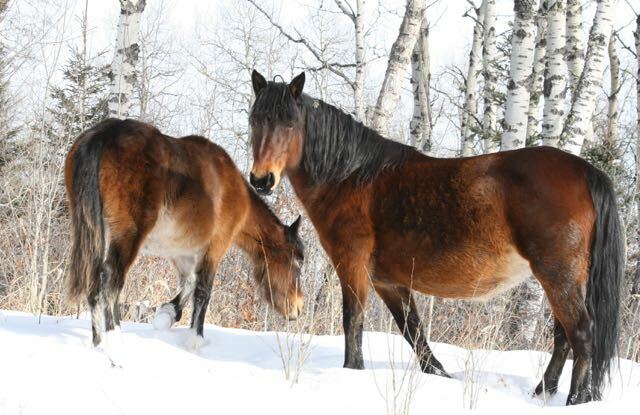 Here is a short video showing the beauty and uniqueness of our Alberta wild horses. 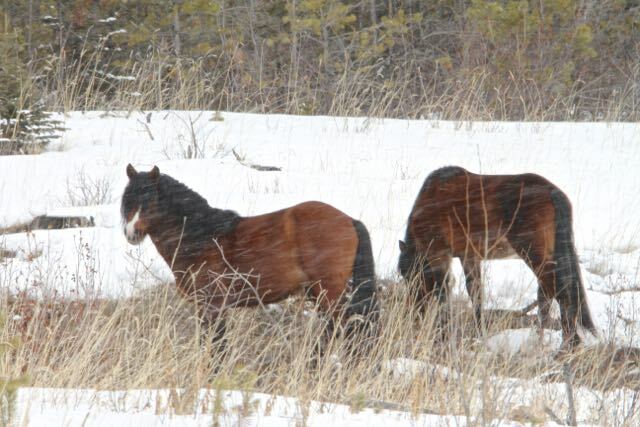 We hope that you enjoyed the video and can admire the treasure that these horses are for Alberta. As soon as it stops raining, which the forest desperately needed, we will be out checking on the horses again. Cascade has been adopted and gone to his new home. Thanks to all who expressed interest in him. 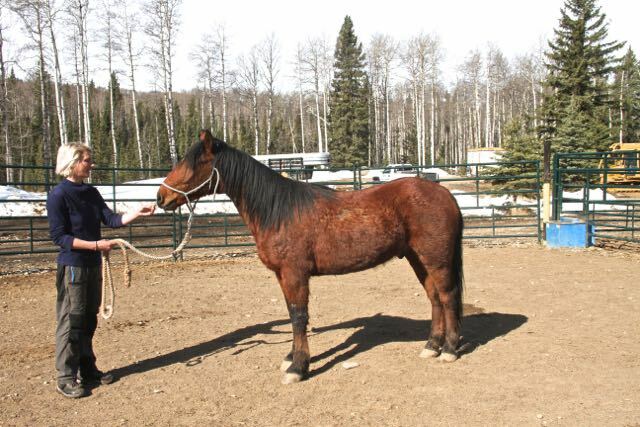 I am a 3-year old gelding who found myself getting into trouble on a rancher’s farm west of Rocky Mountain House, Alberta. My brother and I got kicked out of our herd by the herd stallion who had enough of our shenanigans so off we went. 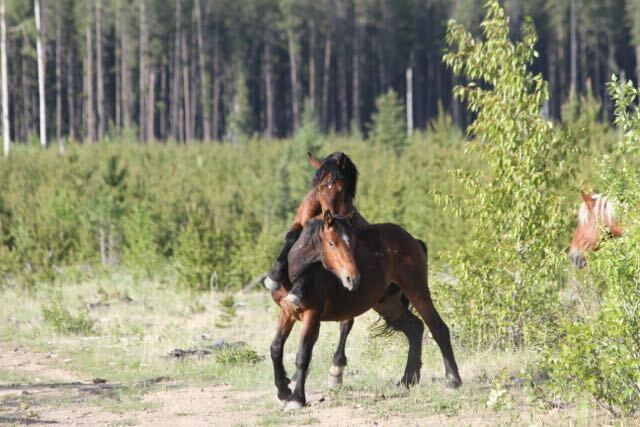 It was fun at first roaming around in the forests and meadows but soon we wanted some company and found a beautiful mare. Unfortunately she lived on private land and we were not welcome. With the help of the rancher and the kind folks at WHOAS, we were encouraged to get into their trailer and came to their rescue facility just west of Sundre. At first we were frightened but soon learned that the humans were bringing us lots of good food and water. Before you know it we had halters on and began to trust these humans who did not want to harm us. Now you should see me. I look forward to being led into their barn twice a day where I get more good food. I can be brushed and touched and its okay. I have been gelded, had my wolf teeth removed, vaccinated and wormed. I have also been freeze branded (W or H right hip) so if I ever get lost or stolen I can be found again. Here one our volunteers is leading Cascade around his pen. This is part of his daily training. Cascade is ready for adoption and looking for his forever owner and home. Contact WHOAS at WHOASalberta@gmail.com and arrange to come out and see him. 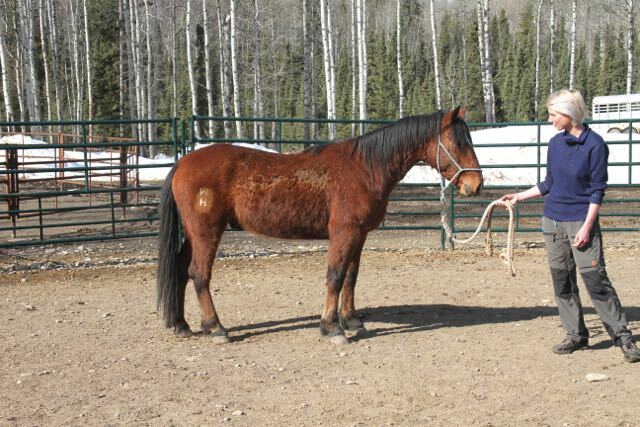 He is not going to be a big horse, maybe 14.1 hh but is strong with good feet. We have found these wildies are quick learners and bond quickly with their new owners. Hard to believe that only 2 1/2 weeks ago the hillsides in wild horse country still had lots of snow covering them. Finally, though, it has warmed up dramatically and most of the snow is now gone. 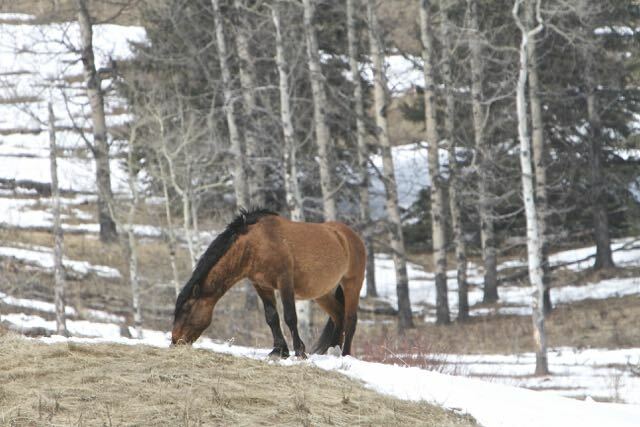 Now the wild horses can start to recover from the very long and harsh winter. 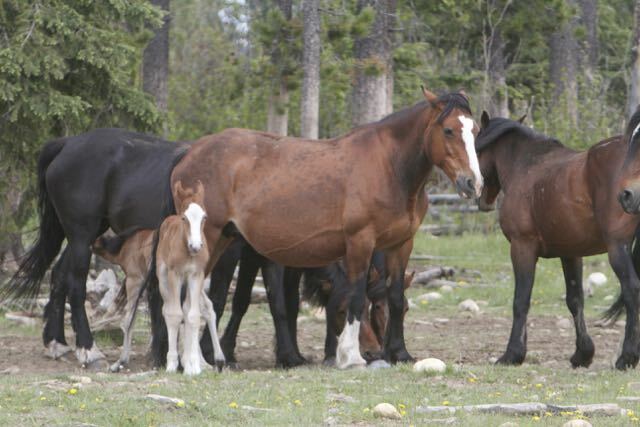 Where the herds were able to find open hillsides, the foals born were able to survive and move out with the herds. This brand new little one was one of those lucky ones who survived because of the open hillsides. 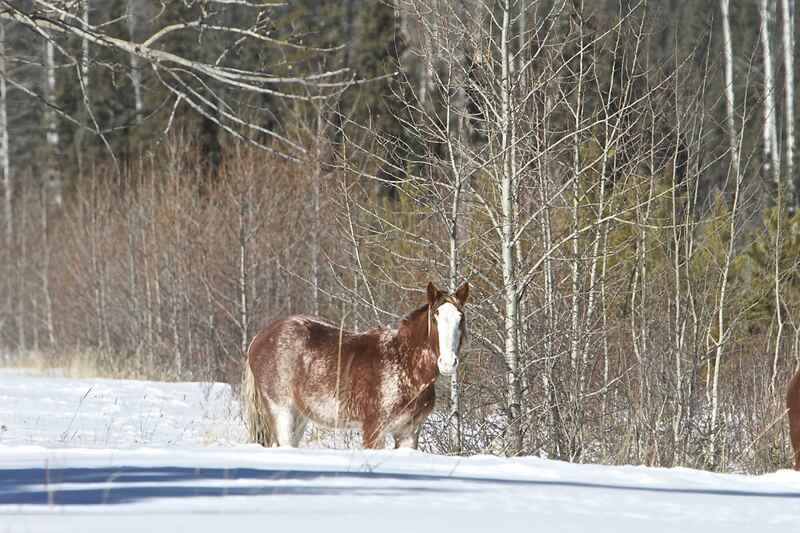 Unfortunately for many of the foals born in the early part of April where the snow was still so deep and crusted, their survival rate was extremely low. Here she is three weeks later looking healthy and following her mare as the herd continually moved to search for the new green grass. 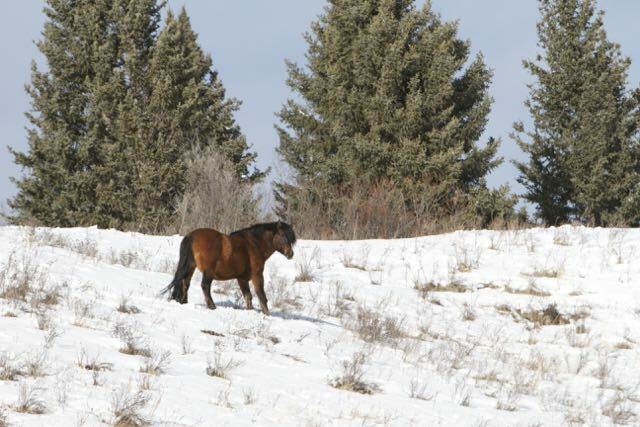 Due to the way that the cold and snow hung on for so long most of the wild horses are still very thin, but now it will not take them too long to recover. 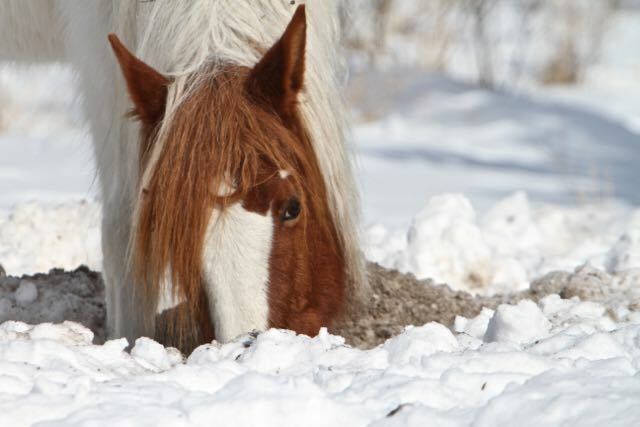 As with the foals, we know of several adult horses that succumbed to the adverse conditions just unable to move about and paw through the deep snow to find enough forage. 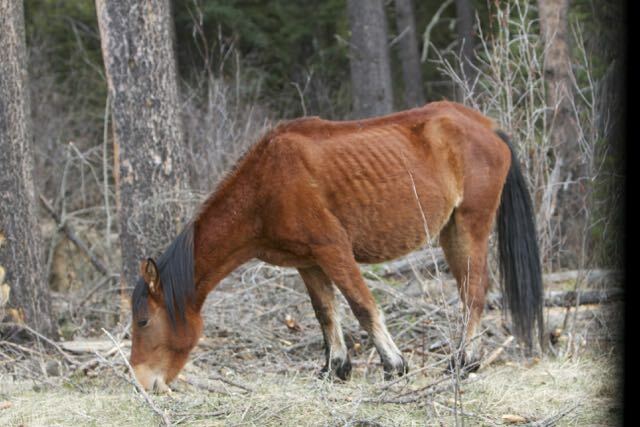 This is nature and goes to show that our Alberta wild horses do have to endure a lot of hardships in order to survive in our foothills. Although most of the roads are now dry some of the back trails are still a little muddy, but we are able to check on the horses a little easier. 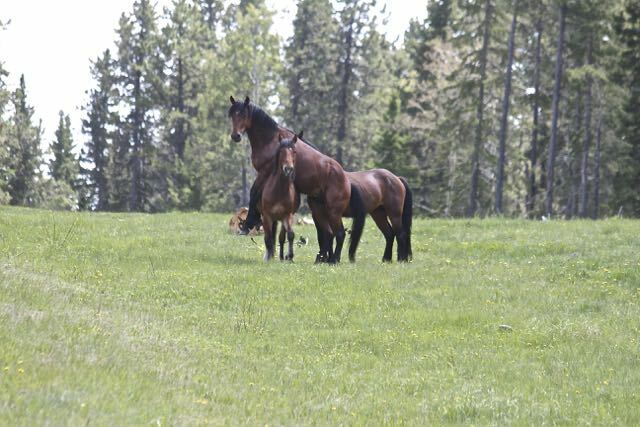 As we travel by vehicle and on foot it is so wonderful to see the foals with their herds, now looking very healthy and full of life. We are always out there trying to locate the different herds that we know and always wondering where a certain herd or stallion is when we can not locate them. This is all part of the research we are doing as part of our MOU’s with the Alberta government. 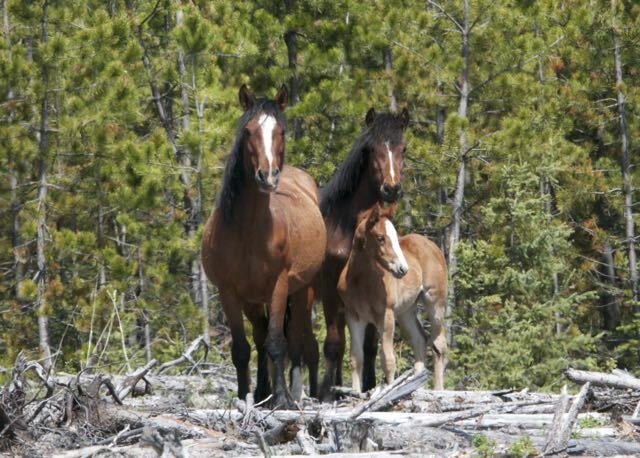 We continue to work toward collecting data and information to show that here is a more efficient and humane method to manage our wild horse population. 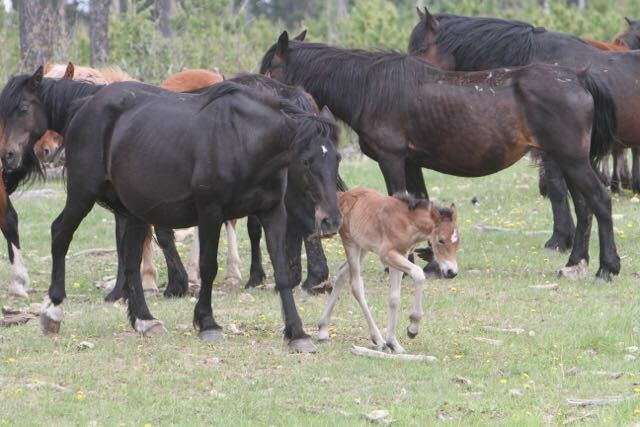 One of the things that has always come up since the Feral Horse Advisory Committee, (FHAC) was initiated by the government is the science that they use to justify some of their population management decisions, such as culling. The one study was done in the late 1970’s by Richard Salter who did his thesis on wild horses and their affect on the landscape. Now I have been roaming these Alberta foothills since the 1960’s and many others who have been doing the same, know how dramatically and drastically the whole ecosystems of this country have changed. So a study done then has little relevance to the horses today. The other research that is used by the AEP is the one done by Tisa Girard in 2008/09. In this study she was studying habitat selection of the wild horses. With her work she radio collared 4 horses in order to study this, but it was done in the McLean Creek area of Kananaskis Country. This is an all year round area dedicated to the use of ATVs and any day of the week there are large numbers of users moving about the trails. In this case how could the horses that were studied not be affected in their movements and habitat selection by the large number of ATVs? 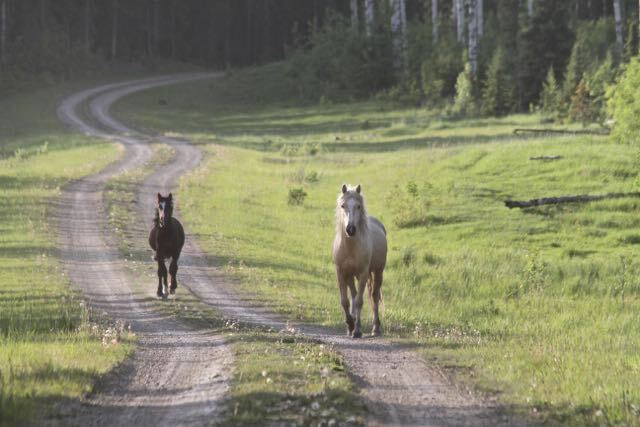 WHOAS has always questioned the AEP’s use of these two particular research projects and we knew that more up-to-date scientific research needed to be done to help understand what affect that the wild horses may have on the landscape and other wildlife using these areas. 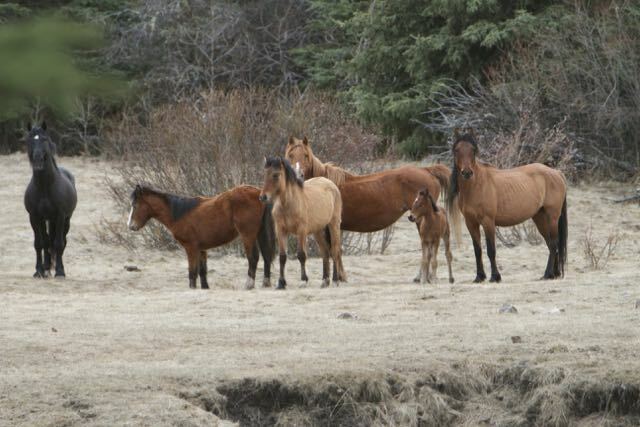 Without it how could proper wild horse management policies be put into place by the government? In 2016 we were in contact with Dr. P.McLoughlin from the U of S in regards to maybe committing to a new research project in regards to this. Dr. McLoughlin has been a leading researcher in regards to the Sable Island horses and other wildlife species in other Canadian provinces. He agreed to look in to beginning such a research program and in 2017 received permission from the university to initiate the research. The one thing that this project had to be was completely independent so that bias could not be used to influence the results. This project also had the approval of the AEP. 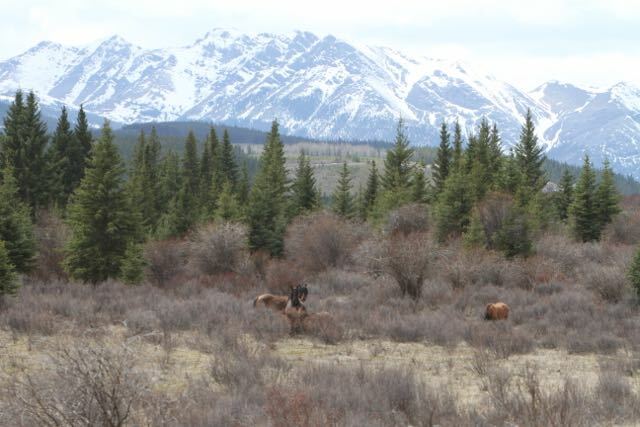 In the spring of 2017 a researcher, Paul Boyce, under Dr. McLoughlin’s supervision began the research work, which will take several years, on the wild horses. All last summer and into the fall the horses were being studied and numerous trail cams were used to track the horses in different areas. 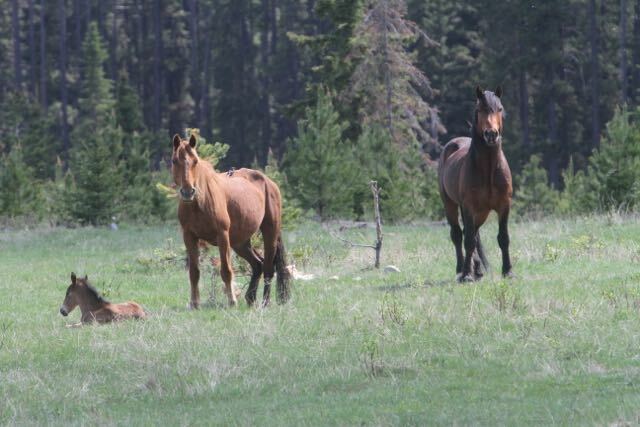 The idea of using radio tracking collars on the horses is still important and after numerous consultations with the AEP a 3-week long permit was issued for the trapping and release of some horses in order to accomplish this. WHOAS did supply the equipment for a catch pen and manpower to set it up. 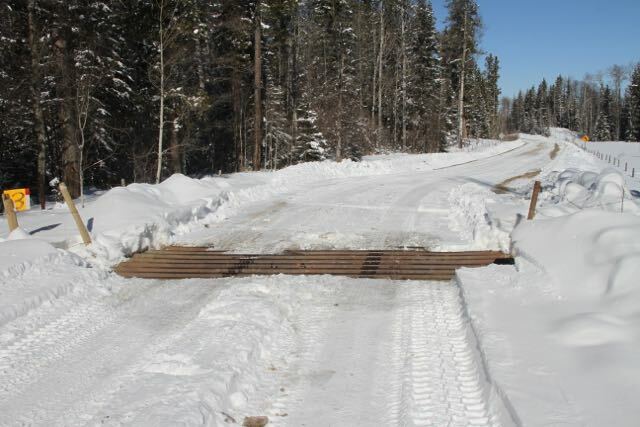 One stipulation was that no pregnant mares would be confined to be collared and in late March a pen was set up in order to attempt to catch and collar 2 horses in the area around the Red Deer River ranger station. Due to the conditions it took almost two weeks before some horses entered the trap. Before the researchers could respond to the pen, someone else came along and released the horses from the pen. So no horses were collared as the capture permit expired before any other horses could be captured. The collared horses would have been tracked by GPS and the collars would have the capability of being released remotely. 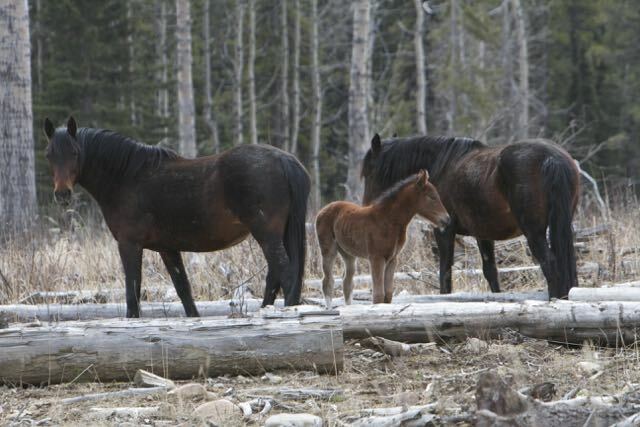 This research is going to be vital in future management decisions around the wild horses. Now I go into all this detail, only to let our followers and horse lovers know what is happening and the setback caused by the individuals that released the horses. They may say they care about the horses but in fact they are doing an extreme amount of harm to the overall welfare of our wild horses and their future. 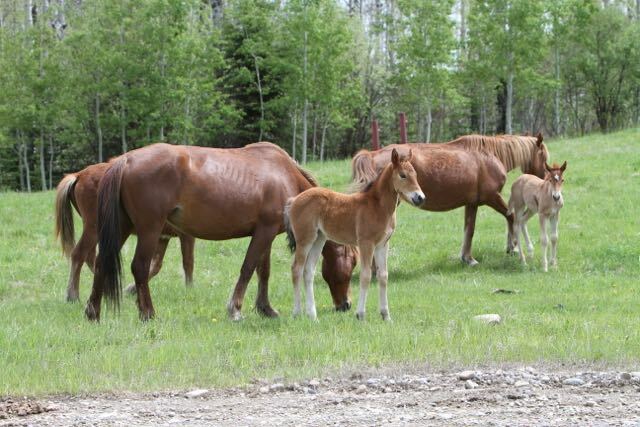 We should not forget, as WHOAS was reminded of in our last meeting with the AEP, that there are still many groups and individuals that want the wild horse numbers drastically reduced or even completely removed. 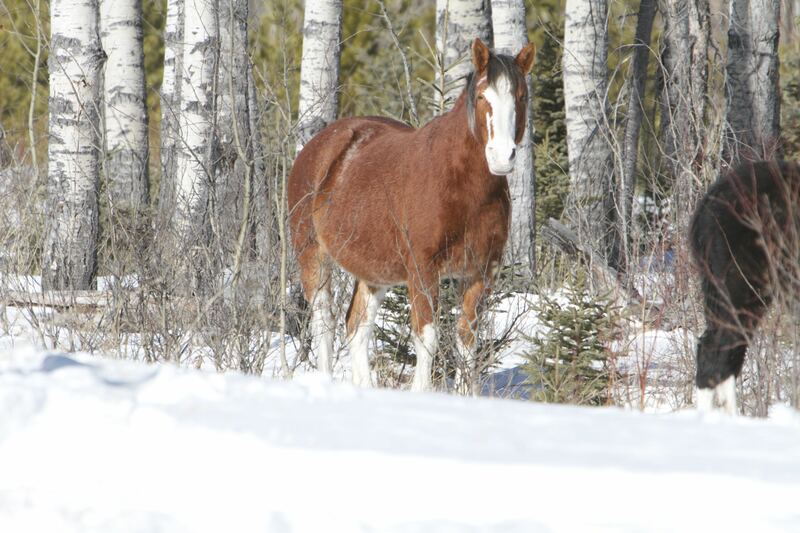 In the aerial census done by the AEP in January of 2018 the count that they came in for the Sundre Equine Zone was 1015 horses, where in 2017 it was 661 horses. Now this was not the actual minimum number of horses seen as in previous years. It is an estimate using a new way of coming up with a population of the horses from the air. This is called “distance sampling” and if a certain number of horses are counted in a certain area then it could be estimated there is a certain percentage more. ??????? Another factor that raises some concerns with me is that in previous years an independent observer accompanied the government staff during the survey. This year that did not occur. Enough with all of this and let’s get back to the babies!!!!! 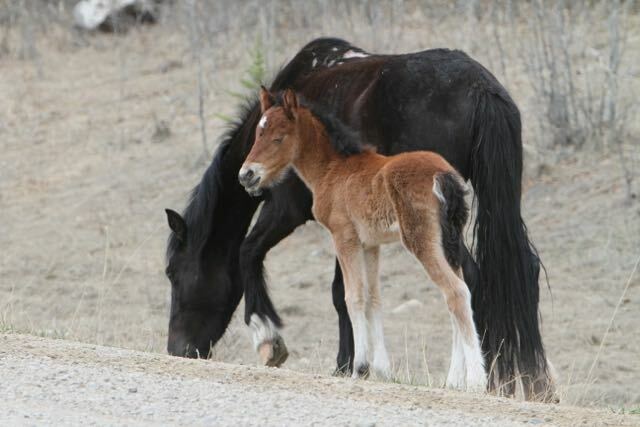 We will continue to keep you up-to-date on the new foals with the herds and what is also happening to your wild horses. The horses will be okay now as the green grass comes on even more quickly. We also want to thank all of you that came out to our Fund Raising dinner at the Olds Legion, which was a huge success on Saturday May 5. Thanks to the legion staff for providing an excellent dinner again and to all you wonderful people who donated items to the silent auction. Also a huge thanks to Lori and Merle Fox for arranging this annual event, once again. We just wish to remind all of our supporters of our upcoming fundraising banquet. 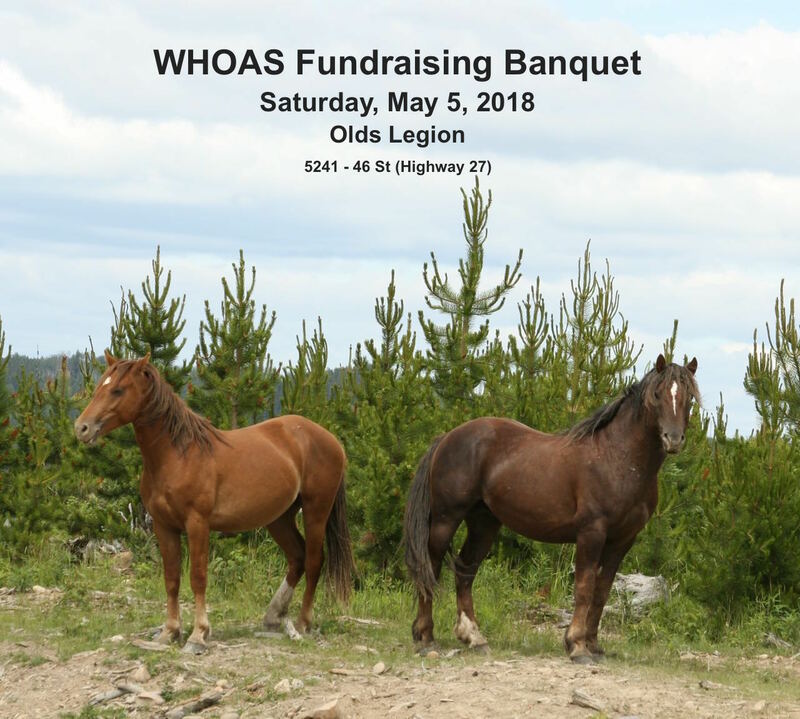 All monies raised goes into our work to save and rescue wild horses that need help. 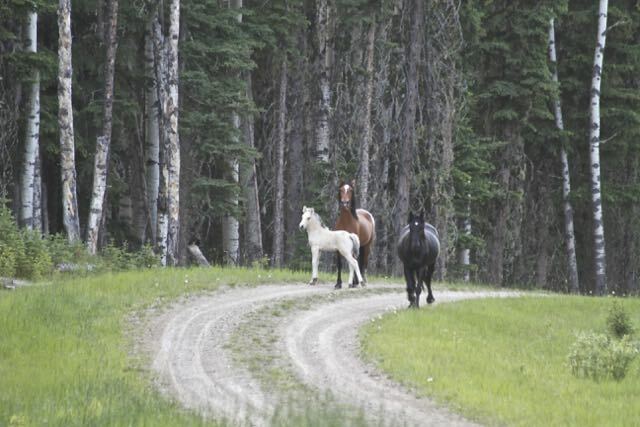 A lot of work still needs to be done to assure that the wild horses of Alberta can remain forever wild and free in the ever changing environment of Alberta foothills. Doors open at 5:00, Refreshments will be available beginning at 5:30 p.m., and a delicious Roast Beef dinner will be served at 6:00. Please contact us here or one of our directors for your ticket. You can also contact us via our email – WHOASalberta@gmail.com – and we can hold tickets for you at the door. Join us for an evening of good food and friendship. We look forward to seeing you and your friends and family. April Fool’s – still snowing. 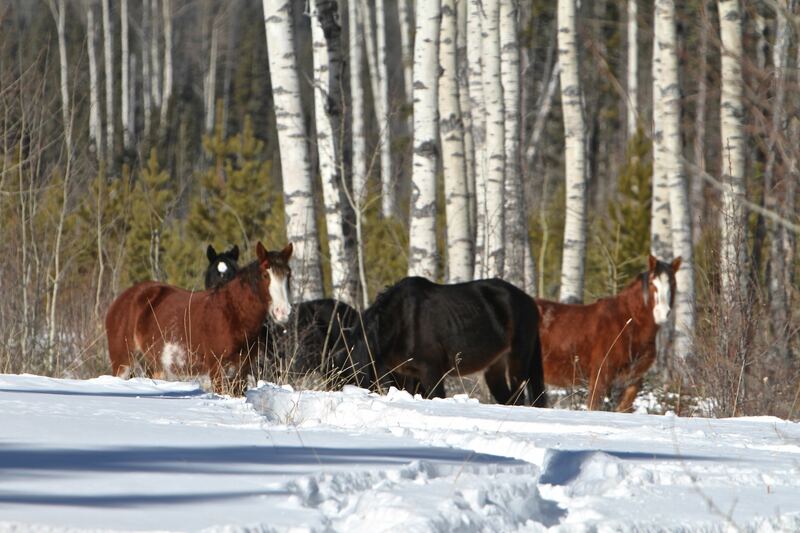 Yesterday as March rolled into April, the snow and cold persist in wild horse country. As we travelled the back roads, we found this group of boys trying to find some feed. 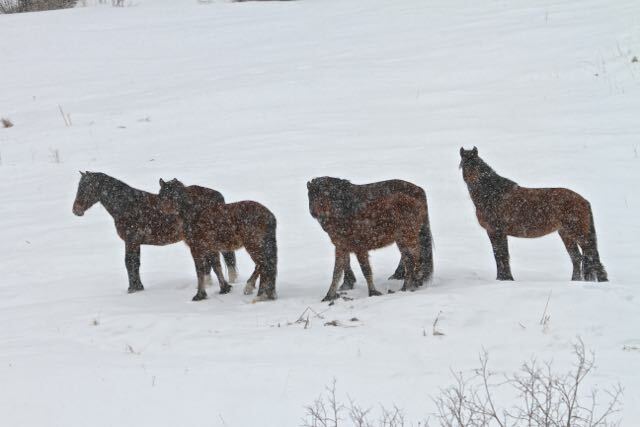 The snow continues to deepen and this causes us concern as the foaling season is ready to start. 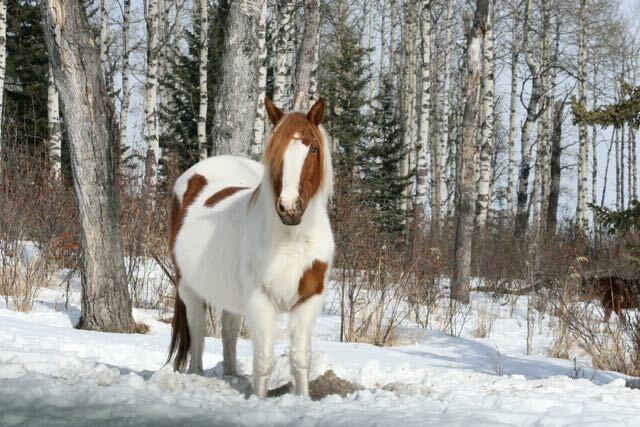 Although the young ones may be able to adapt to the cold, the hard crusted snow would make it very difficult for them to follow their mare. Even these boys had difficulty moving across this open clearing. We hope that the weather will moderate soon and the snow will start to recede and soften making it easier for all the forest’s inhabitants. Yesterday we even saw deer struggling to negotiate to travel across the snow pack. Go away cold and snow! 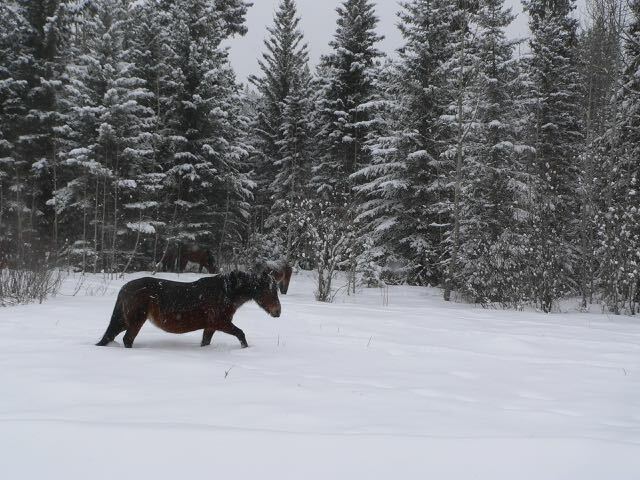 Along the eastern edge of the forestry the snows seems deeper and the horses are sticking closer to the tree lines in order to find something to eat. As we moved further west where there was some open areas, the west winds and sun had started to open up some areas. The horses are moving to find these places. These two young boys were taking advantage of not having to paw. Just when it seems that spring was here and the hillsides were exposed with the warmth of the sun, along comes another snow storm. A little further west, on the real steep hillsides, even on a cold day, the sun has some warmth and has melted the snow. Right now these hillsides are being sought out by several herds. 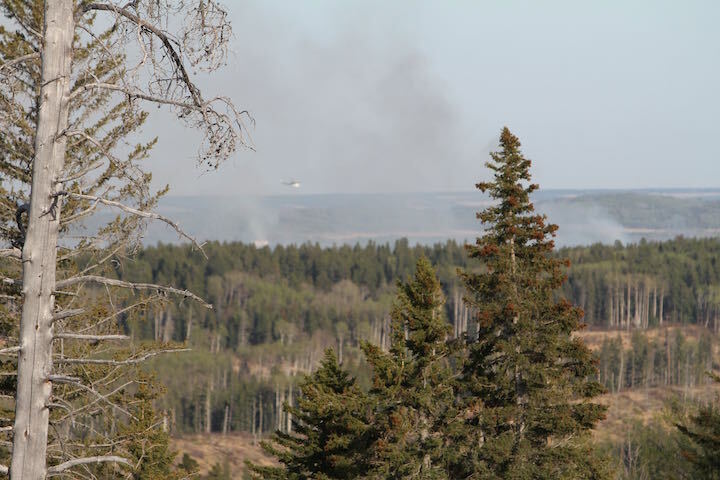 It is hard to believe that two years ago on April 18, a forest fire was raging right where the snow is the deepest this year. 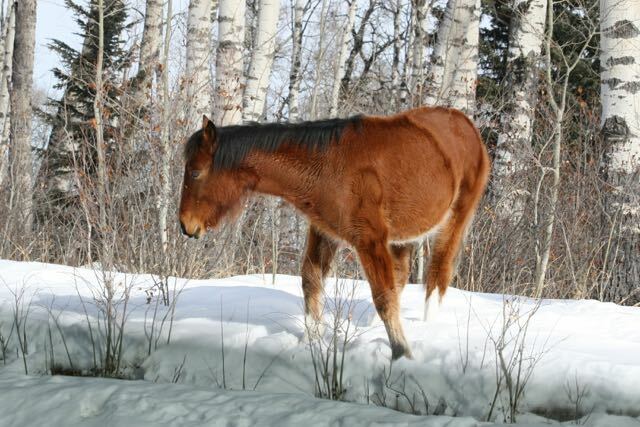 Even last year at this time, there was little snow left and the foals that were born had it easier. 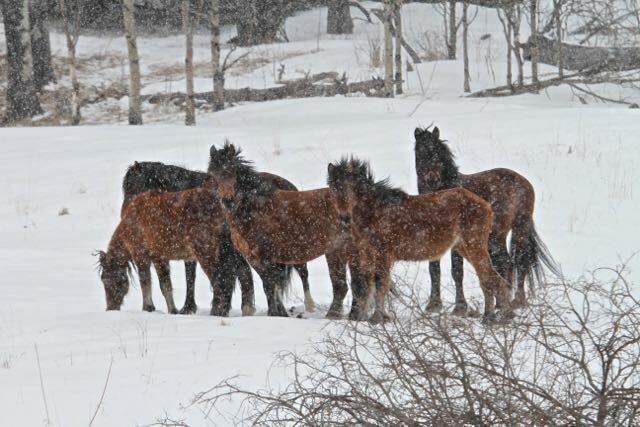 We have not found any new foals yet this year. 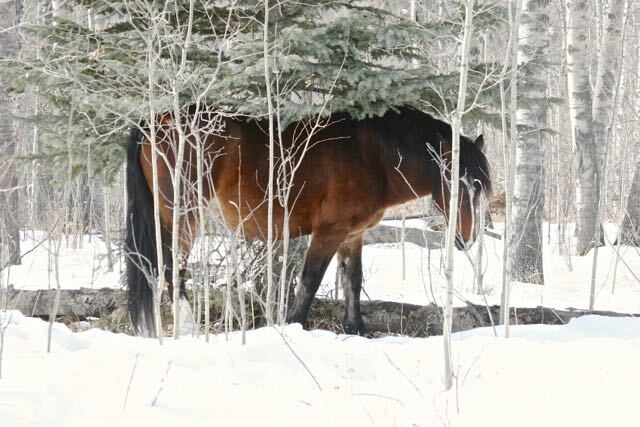 In several locations our members have had to move horses back into the forestry from public roadways. 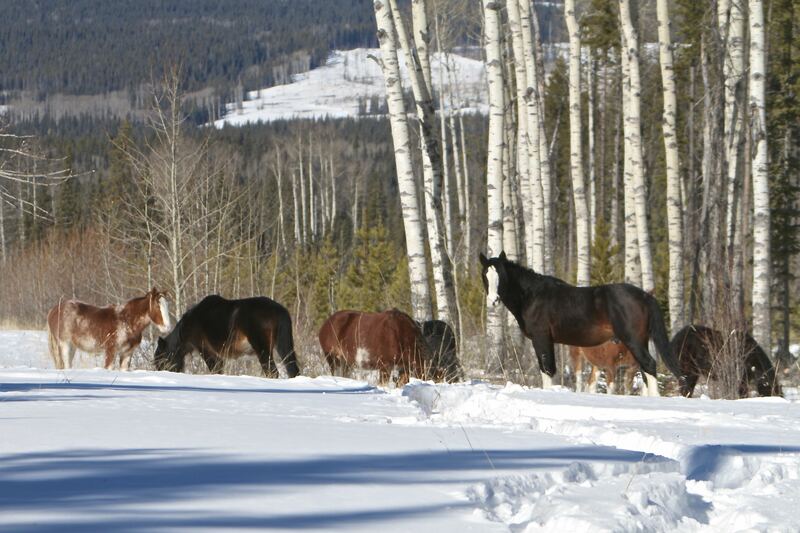 The horses were able to walk straight across the Texas gates that lead into crown land as they were completely filled up with snow. WHOAS contacted the county in regards to this concern and the very next day we were so pleased to find that they had sent in vac trucks to clean them out. We have found no more escapees. We hope that by the time Donoma is ready to foal, that her baby has a warm and dry environment to begin its new life. 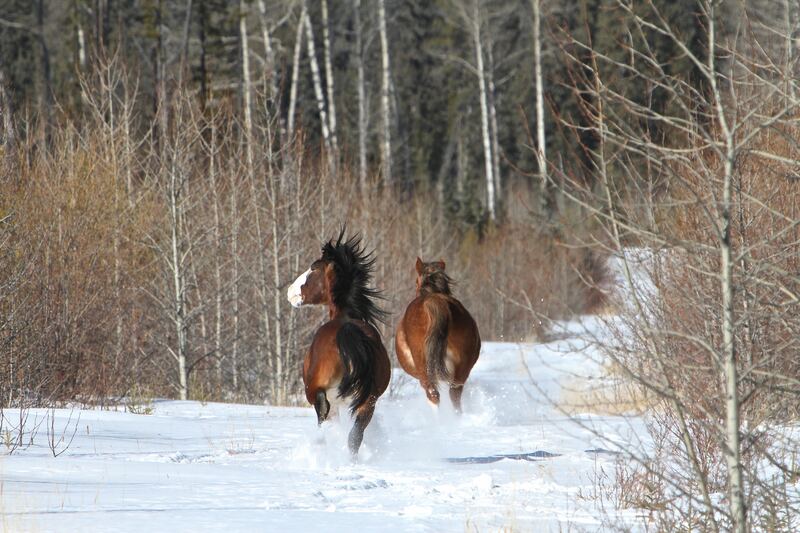 Winter is not letting up in wild horse country. Temperatures are consistently cold and the snow is accumulating. 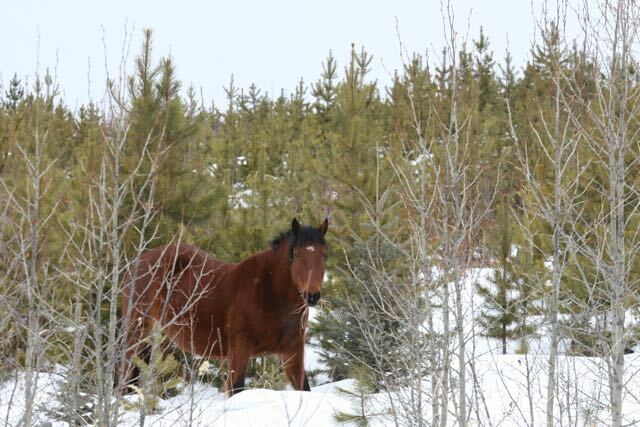 This yearling has found some grass under the pine trees and the horses are starting to have to roam quite a bit in order to find sufficient feed. 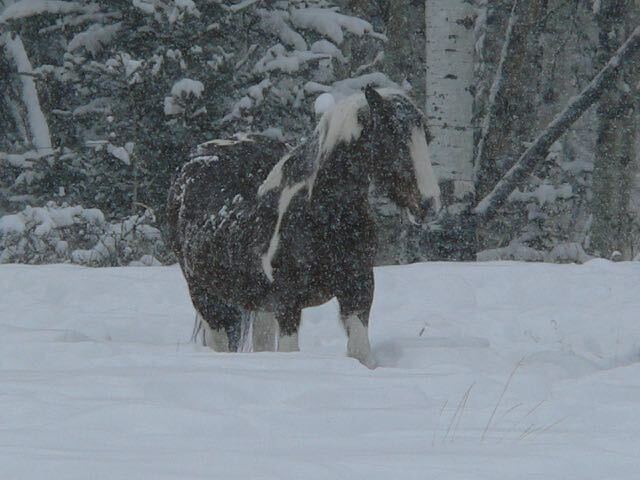 This stallion sought shelter and feed under a mature spruce tree tired of digging through knee deep snow. Who can blame him! For you who purchased the WHOAS calendar, this filly is the “hurdler”. Getting all grown up despite the long winter she is in very good condition and growing. This photo was taken on March 1, just before another 30 cms of snow blanketed the countryside. 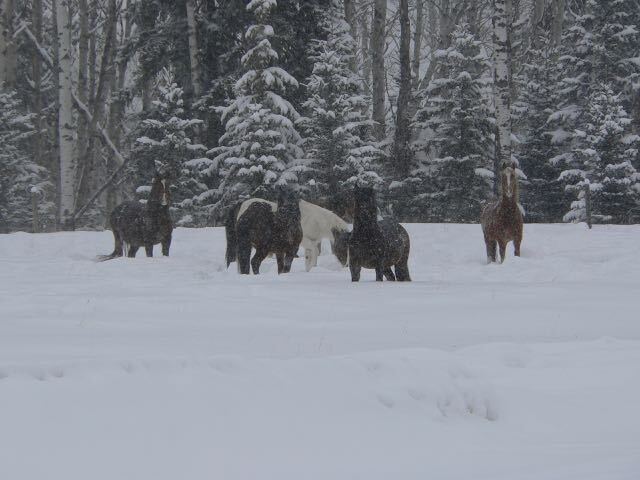 The next day these are the conditions the horses had to face in order to find feed. 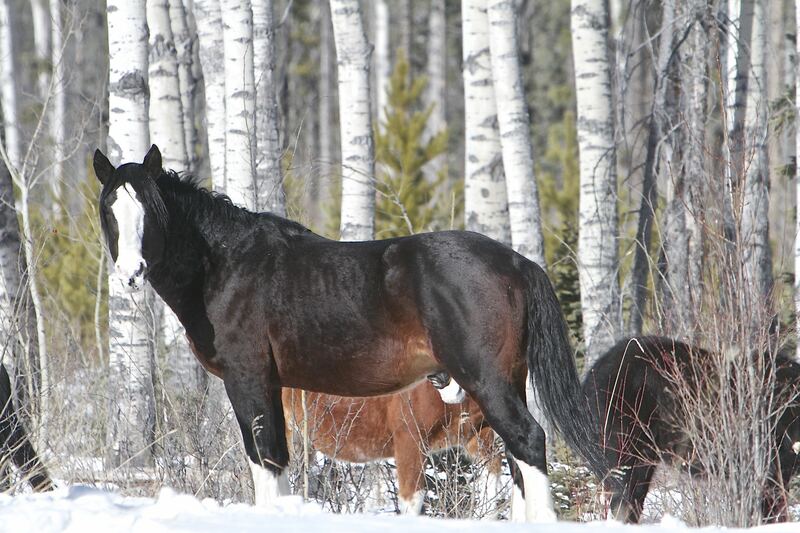 Notice the two youngsters under the mature trees behind this pregnant mare. As the day passed, the snow increased and continued to pile up. This beautiful herd, with snow covered backs, worked together in this opening to paw back the deep snow. One good thing is that the snow is still very soft and has not crusted over which would make survival much more difficult for all the wildlife. Spread throughout wild horse country are natural mineral licks. These licks are important to the health of the horses especially at this time of year in order that they get the nutrients to stay in good health. This beautiful mare has her head deep down getting to the yummy dirt! Look at her muzzle – “I need a napkin!” Satisfied she then wandered off to join her herd feeding behind her. Sunday evening, February 25th, a call came into us from a concerned citizen that a foal had been spotted near Nordegg and it had blood on its body. 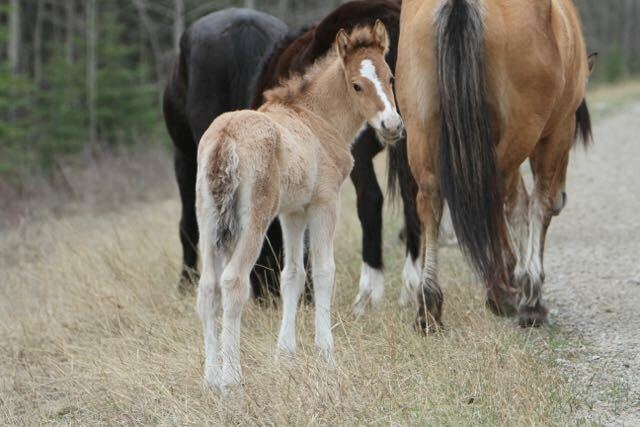 They also told us that the foal was all by itself and its herd was no where to be found. 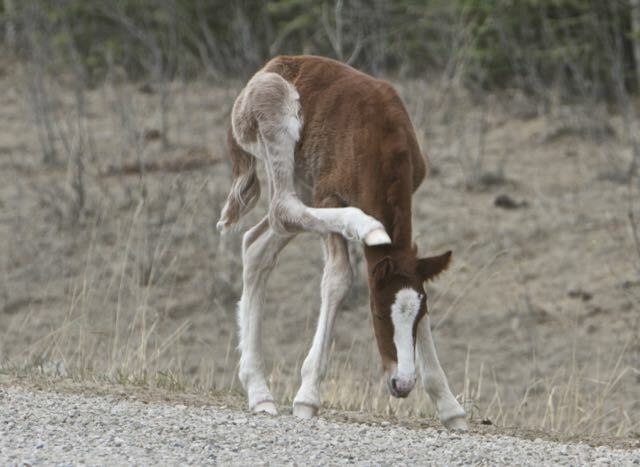 The good part at that time was the foal was on its feet and eating. With little daylight left on Sunday we had to wait until Monday morning to respond. Bright and early on Monday morning with our truck loaded with some hay, halters and other rope, we were on our way. 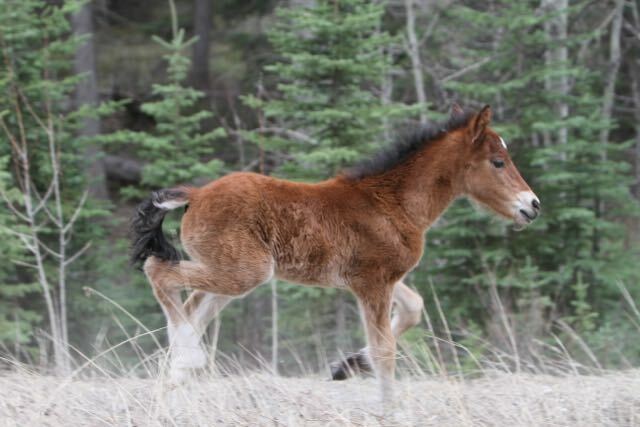 From our place it was over 200 kms to where the foal had been sighted. Arriving in the general area we began to drive slowly down the highway looking for horse signs. 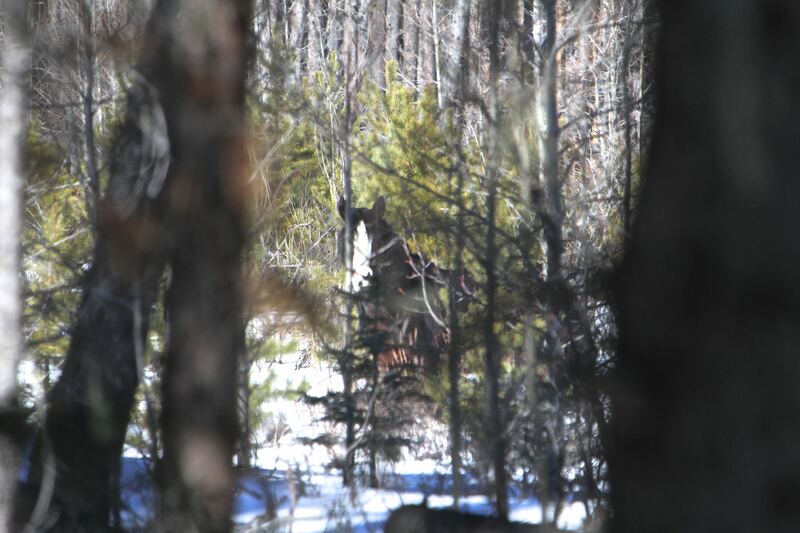 As we came upon an area where there was a lot of pawing and horse poop, we saw this horse peeking through the forest. Brakes on, park the truck, on with snowboots and off we go to look for more horses. 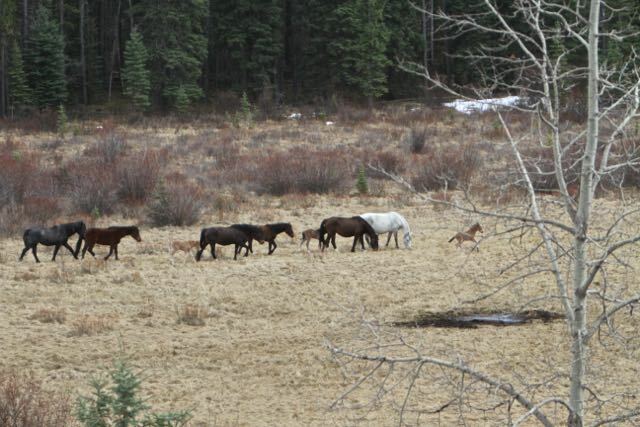 We came into a small opening where we found this herd of Nordegg wild horses. The little filly was standing off to the side and not really wanting to move. As we approached the herd moved closer to her and she was able to move on her own to join up. We were able to get close enough to see that she had a little bit of blood still on her and some small injuries on her right back leg. She was also favouring her left rear leg. Otherwise she looked okay and not in any distress. We made the decision that it would be best to leave her with her family and not intervene at all. This is the magnificent herd stallion who came to put himself between his herd and these strangers. 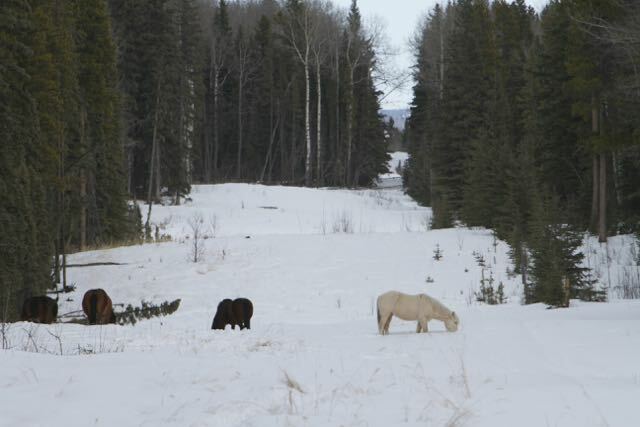 These Nordegg wild horses are larger than the ones found west of Sundre with many of them having the distinctive bald face and white socks. Still so beautiful. 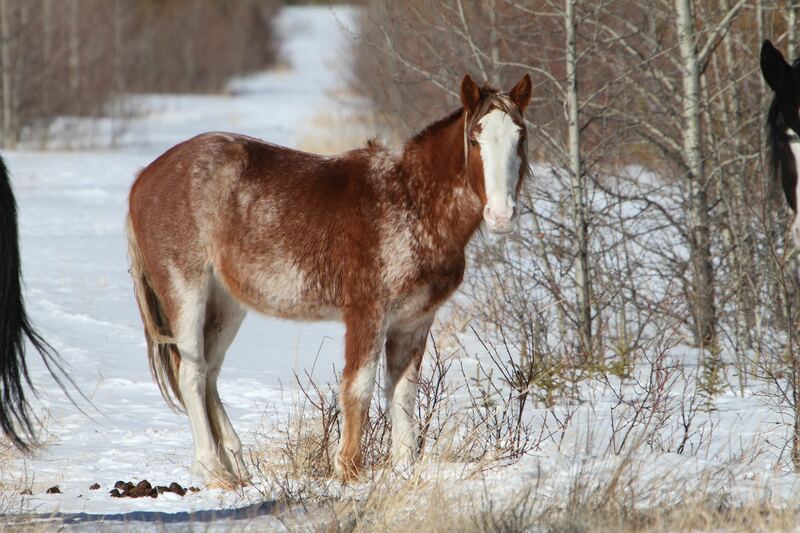 This mare is pregnant and will more than likely pass those unique physical characteristics onto her offspring. 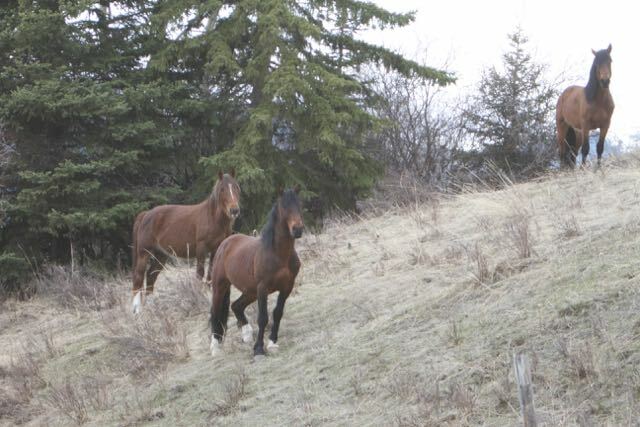 These horses live a very precarious life inhabiting the clearcuts along busy highway 11. As we stood in the deep snow snapping pictures, these two young studs came out of nowhere and took off down the cutline. 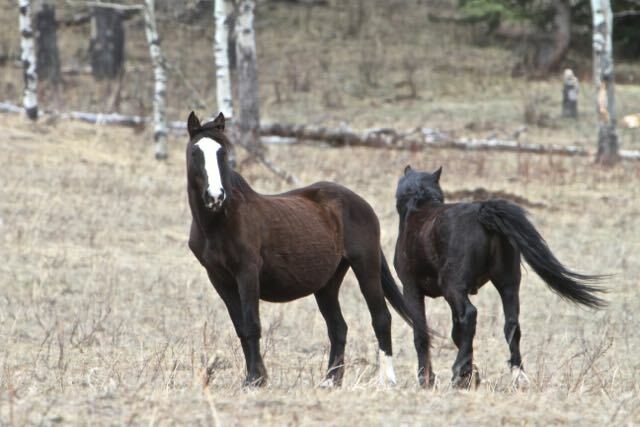 The caused the foal and her herd to also quickly abandon the scene. Before being interrupted, the other young foal from the herd came out to buddy up with his herd mate. We are glad that this story had a happy ending and hope that these two grow up strong and healthy. We will be checking back on them.